Premium Swedish mic‑makers Ehrlund take their unique triangular‑diaphragm technology to the stage — and the results are impressive! Boutique Swedish microphone makers Ehrlund manufacture a small but very interesting range of high‑quality capacitor microphones which all share a unique feature: they employ a triangular diaphragm in their capsules, rather than the traditional circular diaphragm shape. Of course, not everyone uses circular diaphragms — rectangular designs feature in microphones from a number of manufacturers, perhaps most notably Pearl and Milab (both also Swedish companies) and, more recently, Audio‑Technica. However, Ehrlund’s approach is currently unique to them, and based on the idea that a triangular diaphragm has much better self‑damping characteristics — meaning that it resonates much less and for a much shorter duration — than the equivalently sized circular diaphragm. The benefit of that is a more accurate transient response, and greater transparency at mid and high frequencies. In addition, whereas the high‑frequency extent of a circular diaphragm is determined by its diameter in relation to the sound wavelength, this is not the case for a triangular shape, since the width of the diaphragm is not constant but continuously changing! Consequently, a triangular diaphragm remains responsive at very high frequencies, and the audio bandwidth is therefore greatly extended in comparison to a circular diaphragm of the same diameter. In essence, this innovative design combines the low self‑noise that comes with a large surface area, but also the good damping, accurate transient response, and high‑frequency sensitivity of a very small diaphragm. Of course, it’s not all plain sailing. Supporting and sealing a triangular diaphragm above the capacitor backplate is not without issues, but Ehrlund seem to be able to make it work very well, if my experiences with some of the company’s other microphone models are anything to go by (I reviewed the EHR‑M in July 2012, and we’ve also reviewed the company’s triangular acoustic pickup in April 2006). Brand new to Ehrlund’s range of capacitor microphones is the EHR‑H model, which is the company’s first dedicated live‑sound vocal microphone specifically designed for handheld use. 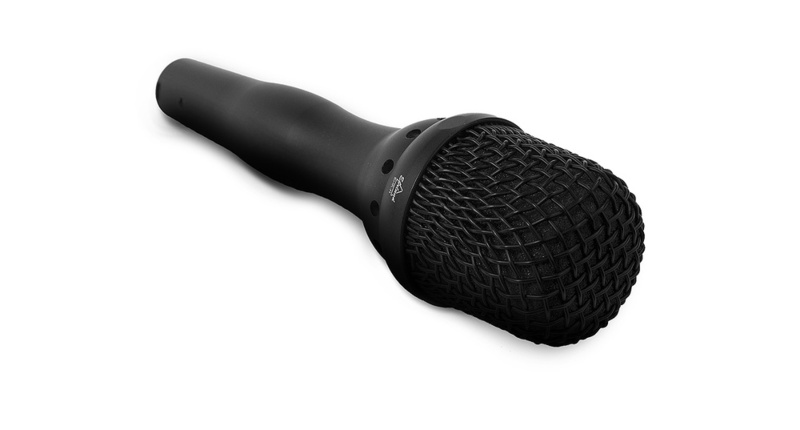 This elegant mic is shipped with a sturdy protective zipped case containing the mic along with a rubber stand adaptor. A mesh pocket in the lid could be used to store a short cable or other accessories. Before examining the mic in detail, it’s worth noting that the stand adaptor is also a little unusual. I wasn’t surprised to find that the mic stand attachment is machined for the US‑standard 5/8‑inch thread, but what I wasn’t expecting was to find a European 3/8‑inch threaded section further inside. I don’t think I’ve seen this idea on any other mic stand adaptor and it initially appears to be a neat alternative to the removable threaded adaptor that most manufacturers employ. However, the usability of this dual‑threaded socket relies on the mic stand itself having a small enough diameter (or a long enough 3/8‑inch threaded section) to reach far enough inside the Ehrlund mic clip. Amongst my collection of mic stands and mounting attachments I only found one that could screw directly into the 3/8‑inch part of the adaptor reliably; for all of the others I had to resort to installing a conventional threaded adaptor. So although this novel design is a nice idea, perhaps it’s not quite as practical as hoped. On first taking the EHR‑H from its protective case, it initially looks to be a pretty conventional handheld vocal mic — but closer inspection reveals some thoughtful features. The aluminium body measures 182mm in length and 53mm across the head grille, and has a matte‑black powder coating. Weighing in at 272g, the mics sits very comfortably in the hand thanks to its specially shaped body, which is machined to have a narrowed ‘waist’ — which is also the balance point — just below the capsule’s rear sound‑entry ports, combined with a slight bulge lower down the handle which sits nicely in the palm. The mic’s serial number is etched into the base of the handle just above the XLR output connector, and the manufacturer name and model are etched into the ring at the base of the nickel‑plated stainless‑steel grille. This grille can be unscrewed for cleaning and comprises a relatively open‑weave black wire mesh, lined with foam to control plosives and moisture ingress. A layer of fabric is stretched across the top of the capsule to provide additional protection for the diaphragm itself. The ring at the base of the grille has four flat spots machined into it to reduce the risk of the mic rolling away if placed on a flat surface, and a dozen small round holes allow sound into the rear of the pressure‑gradient capsule. As might be expected, the mic’s polar pattern is described as cardioid, and the generic polar plots published in the manual suggest it is quite a wide cardioid, with the frontal pickup area being extremely consistent for all frequencies across a ±90 degree angle. Only the extreme HF starts gradually to drop off as the source moves well off‑axis. Impressively, the published 90‑degree off‑axis frequency response matches the on‑axis response almost perfectly up to about 12kHz, but with a consistent ‑10dB attenuation. Few mics — even quite expensive ones — manage this consistency quite as well, and the advantage is that off‑axis sources and stage spill will be captured without coloration, making mixing a lot easier and feedback a lot less likely. However, the rear rejection shown on the plot suggests the mic’s polar pattern tends more towards a hypercardioid above 4kHz, with nulls delivering around 20‑25 dB of attenuation at angles of 150/210 degrees. Below 2kHz the pattern turns more towards a hypocardioid shape, with rejection at 180 degrees falling to around 7dB below 250Hz. This is fairly typical behaviour for most large, single‑diaphragm mics. What is much less typical, though, is the EHR‑H’s remarkable frequency response, which is quoted as extending between 7Hz and 87kHz (no limits given)! Looking at the published frequency response in the manual, it appears fundamentally flat from about 80Hz to 6kHz (as measured at a 15cm distance), with a gentle presence lift rising above that amounting to about +3dB and extending smoothly way beyond 40kHz before rolling off gently above 80kHz. This enormous bandwidth contributes to the mic’s impressive transient handling, of course. The microphone’s low‑end response is also a little unusual, in that it appears to be internally filtered with a shelf‑like equalisation curve which introduces around 10dB of shelving cut below 80Hz, and finally rolling off below 10Hz. This deliberately reduced LF response is presumably designed to compensate for the proximity effect during normal use, as well as reducing the likelihood of low‑frequency stage feedback. Given the relatively large size of the EHR‑H’s triangular diaphragm, it’s no surprise to see a very respectable self‑noise figure of just 9dBA, while the maximum SPL capability is given as 136dB for 1 percent THD (or 131dB SPL for 0.5 percent THD), and the electronics apparently won’t actually clip until 155dB SPL! So I don’t think even the loudest vocalist is going to stress this mic’s dynamic range capability. Naturally, the EHR‑H requires standard 48V phantom power, but draws a very modest 2mA. The nominal sensitivity is given as 8mV/Pa, which is within a decibel of the Sennheiser e965’s sensitivity, or about 5dB hotter than the Neumann KMS104, and 12dB higher than a Shure SM58 dynamic vocal mic. Ehrlund claim the microphone’s electronics are optimised to maintain a particularly accurate phase response, as well as being virtually noise‑free. In use, I found Ehrlund’s new microphone sounds very good indeed. Its dominant character is of a classy, smooth, and natural sound quality, without significant presence peakiness, and with a well‑controlled low end — and in that respect it comes across more as a studio‑quality vocal mic rather than a typical stage mic. It proved impressively resistant to plosive popping, and pleasingly tolerant of positioning, too, with only very modest changes to level and bass response in typical use. Off‑axis stage spill is usefully attenuated and uncoloured, and I didn’t have any problems at all with feedback. Handling noise wasn’t quite as good as I’d hoped, but it’s not bad by any means, and the mic really does sit very comfortably in the hand. There was no hint of that high‑frequency ‘edginess’ that can afflict many large‑diaphragm mics due to diaphragm resonances, and in that respect the EHR‑H shared some of the high‑end smooth naturalness associated with modern ribbon mics. I would envisage this mic being particularly popular for ballad, jazz and popular classics vocalists, where naturalness and accuracy are considered more important than an ability to cut through a powerful backline mix. However, the EHR‑H is significantly more expensive than familiar stage favourites like the Shure KSM9, Neumann KMS104/105, and Sennheiser e965. Given the unique capsule engineering, this was never going to be a cheap option, but the build quality and classy sound do go a long way towards justifying the expense, and this unusual microphone is well worth an audition by anyone in the market for a high‑end stage vocal mic. There are no other stage vocal mics with triangular diaphragms, but high‑quality capacitor capsule alternatives include the Neumann KMS104 and 105, the Sennheiser e965 and its siblings, and the Shure KSM9, amongst others. Enormous bandwidth and very smooth frequency response. Accurate transient response with minimal HF resonances. Well-controlled cardioid polar pattern with good off-axis quality. Consistent sound in normal use. Ehrlund have re-engineered their unique triangular-diaphragm capsule into a handheld stage vocal microphone, with excellent results. Momentum Audio Sales +1 888 470 0067.